Great lighting can really make a house feel like a home. While we tend to focus on the energy efficiency and design of lamps and bulbs, often we neglect to consider the actual electrical system in the house. Whole House Lighting Control System by Verve Living Systems brings a whole new element to eco-friendly lighting. A wireless lighting system that works via radio frequencies without the need for batteries, it works by routing all lighting to a programmable central controller. Each switch transmits a ‘blip’ of a radio transmission to the central hub up to 300 feet away, get this: by using the energy from the act of flipping the switch. That’s right, the switch itself powers the transmission without needing batteries or its own power source, so they are completely independent and self sustained units. This allows them to be mounted anywhere, you could even just carry it around in your pocket if you want. 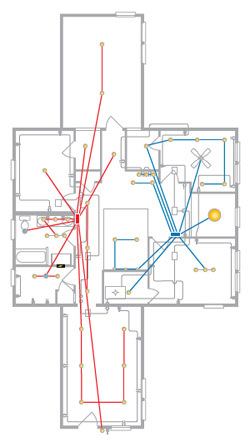 By eliminating the need for light switch wiring and having a central hub to control lighting of the entire home, one can program an endless combination of lighting scenarios, and change it without having to do any re-wiring. The energy saving opportunities are equally as enticing. 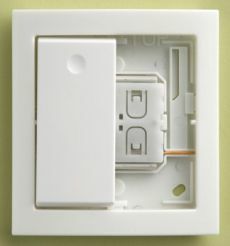 A one switch shutoff for the entire house so you won’t have to worry about that closet light you forgot to turn off. The benefits of the system are endless. Not only does it greatly reduce lighting install time, labor, and cost due to the lack of a need for wiring switches, but the switches can be installed anywhere, and moved at any time. The system is completely programmable, so you can change the operation of each switch, or group lighting elements together. Imagine turning on one switch and having your entryway, driveway and garage lights all turn on at once, and then be able to click a button in your car to just turn on the driveway and garage lights only. Homeowners can use the system to raise or lower the intensity level of every light in their home from any switch or combination of switches, thereby creating home environments that support and enhance their state of mind. They can use it to create lighting scenes and pathway lighting, to turn every light in the house on or off. The Verve system provides 100% whole house dimming, which results in dramatic energy savings and extended bulb life. Because all switches are 100% movable, homeowners can change switch locations any time they want or need to. Billed as more of an entry level central programmed lighting system, it offers a quick and easy programming but does not have many of the bells and whistles of higher end systems with more complex programming, advanced logic, multiple button keypads, LED status lights and the like. When you compare them to a more traditional wired system, there really is no reason not to go with a whole house lighting control system when it’s made this easy. The total cost for a 3,000 square foot home runs about $3,000, and is for new construction only. 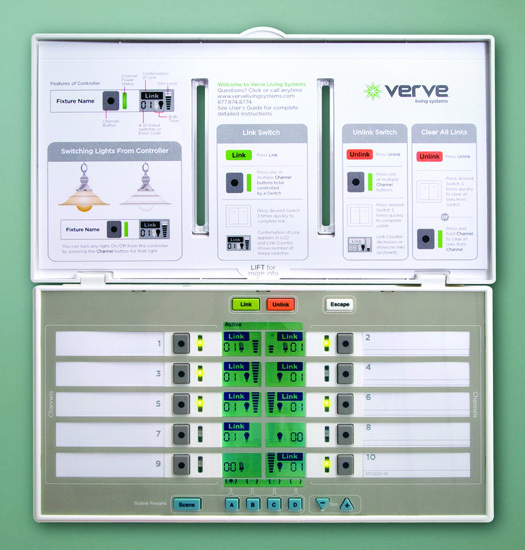 Check out Verve Living Systems website for more information on the system and the technologies used for the switches. Great post, the benifit’s of installing energy efficient lighting are endless. This system takes that to a whole new level.